• Fill a deep bowl or pan with enough cold tap water to cover an egg. 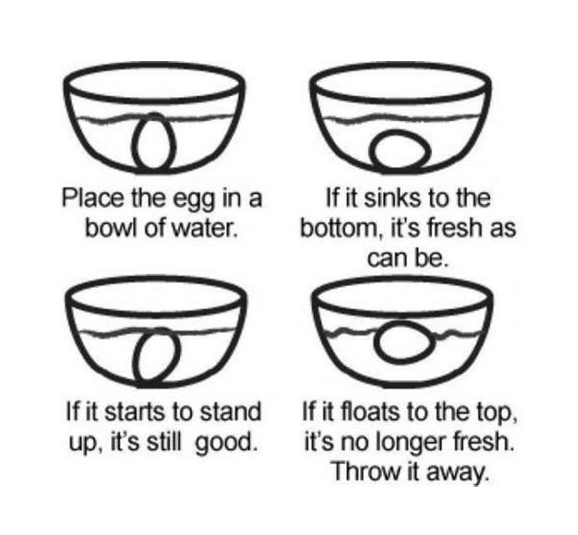 • Place the egg in the water. • If the egg lies on its side on the bottom, the air cell within is small and it's very fresh. • If the egg stands up and bobs on the bottom, the air cell is larger and it isn't quite as fresh. • If the egg floats on the surface, it it should be discarded. • A very fresh egg out of the shell will have an overall thick white which doesn't spread much and the yolk will stand up. • Grade AA eggs are the highest grade available. They cost more than other grades, but may be a good choice because of their high quality and longer shelf life. • Store eggs in the refrigerator small end down in their original carton. • Eggs which are a week or so old are easier to peel than very fresh eggs when cooked in the shell.